This week at PDC the Dynamics CRM team is taking the wraps off a few select platform features coming in the next major release of CRM. A few weeks before PDC I sat down with some of the program managers and devs on the team to discuss a few of these features. In this first video I chat with Andy Bybee, Humberto Lezama Guadarrama and Allen Hafezipour all program managers on the CRM platform team thinking about programmability and the developer experience. We talked about some of the thinking that went into CRM “5” (that’s a codename, by the way). Don’t look for any schedule information in here. CRM “5” is still a long way away. We’re talking about this developer-focused stuff early to help developers with design and architecture as they think about future designs. The team is still committed to power of choice and so will continue to use the exact same code base across on-premises, partner-hosted and Dynamics CRM Online. 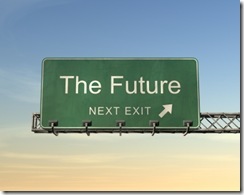 The features that you see in revisions of CRM Online will fold into CRM “5”. Since the folks I was talking to think mostly about the platform they had a lot to say about that. CRM “5” is not about building generic applications. The team has a laser focus on enabling the patterns they see over and over again when devs are building line-of-business applications. One area they are thinking hard about is how to solve some of the problems that ISVs run into when building on the platform. A primary concern is simplifying the deployment and upgrading of applications and protecting intellectual property (IP) rights of those applications. Another area you’ll see a lot of work in is the user interface. The team talked about the work done on end-user experience with the page model. They are working to improve usability and help with the density of information. Andy talked a lot about cloud services. BTW, when we recorded this a few weeks ago the Azure brand had not been announced so we just referred to this generally as “cloud services”. CRM itself does not run in Windows Azure (formerly known as Red Dog). Applications running outside the firewall would run great and be easiest to develop on Windows Azure. In the CRM world we refer to these as self-service applications. On the other hand, if you’re building line-of-business applications that would run behind the firewall those would run great and be easiest to develop on Dynamics CRM. Microsoft .NET Services (formerly known as “Zurich”) provide the glue that can pull those two types of applications together so that they can share information. The Azure Services Platform makes service-to-service integration much easier and safer by providing capabilities like identity, access control, relay service and workflow. Andy does a great job of describing on the whiteboard how CRM and .NET Services work together to build systems that avoid what Humberto calls the “funky stuff”. Code on the server is a pain point today for devs trying to build applications on the CRM Online platform. Allen talks about some of the thinking that went into designing this core new feature. As you can imagine this sort of thing has important implications in so many other areas (coding, debugging, operations, monitoring etc). Also, although the thinking first started with the idea of getting code on the server for CRM Online, what the team has done actually provides important capabilities to all types of deployments. We’ll go into a lot more detail on this cool stuff in a couple of other videos later this week. Stay tuned to this site for that. I finally got myself registered for PDC last week. I noticed that we’ve now published a few Dynamics sessions. These look to be really interesting. Since PDC is the conference where we talk about the future of the Microsoft platform, I’m anxious to hear what Andy Bybee and Humberto Lezama Guadarrama have to say on the future of Dynamics CRM. I also noticed that Adam Wilson and Matt Humphrey will be talking about the Dynamics Online Commerce and Payment API. That one sounds interesting. The Dynamics products sit at the very top of the Microsoft stack so that there are, of course, a ton of other sessions related to the future of technologies that are currently built in or soon will be . I would love to get together with others while in LA; especially ISVs and VARs that are developing on Dynamics or thinking about it. If you’re going to be at PDC and would like to get together to chat about Dynamics, CRM or anything else drop me a line via the email link above. David “Mr. Dave” Yack sent me a copy of his latest project this week. 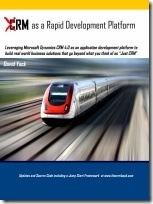 Dave’s written a book on developing with the Dynamics CRM called “CRM as a Rapid Development Platform.” I haven’t had a chance to read through all 700 pages, as I just got it a couple of days ago, but it looks darn good. Dave’s a smart guy. He did quite a bit of training for us when we were out helping ISVs get an early start on Dynamics CRM 4.0 development. His survey scores consistently came back really high. A sure sign that he knows his stuff and knows how to teach others. He also helped to write the CRM ISV development white paper we released not that long ago. There’s lots more information about his book over at the book web site. What’s new in CRM 4.0 for users and developers. How to setup a development environment to be more productive. How to use the dynamic SOA Web Services, including detailed reusable how to’s. Explanations of using the Metadata API to read and update metadata, including the Multi Language capabilities. How to build .NET Plug-ins that extends the platform, including several reusable examples. Deep exploration of Windows Workflow Foundation customization, including building .NET custom activities. Jump Start Framework – Thousands of lines of .NET code to help with Authentication, Plug-ins, and Workflow Activities. In yesterday’s video we talked about WPF and showed off some mind-altering 2D and 3D animations :). As we said then, WPF provides access to local data and resources as well as access to bare metal performance including 3D graphics acceleration. But you can’t take that sort of thing to the web. While WPF will run in a browser, that browser needs to be Internet Explorer running Windows. Since CRM is built on web services and has a local web server, you call the exact same web service whether you’re offline or online. The only difference is that when you’re offline the endpoint is local and when you’re online the endpoint is on the server. Girish shows us the code to do that and it’s pretty simple. Something on the order 10-15 lines. Sweet! The WPF TimeManager app is a composite app that pulls info from the outlook calendar (something you wouldn’t be able to do with a web app) and from CRM itself to reduce the time and effort required to submit a time sheet. When you’re done it then posts that back to CRM for tracking, reporting and billing. Obviously since we’re using WPF here the user experience is a cool rich immersive one. We also take full advantage of WPF to show off some of the rich data visualization possibilities. Girish switches easily from project to category view to look at the time sheet from different perspectives. We also shows off some cool 2D data visualizations of historical data by month, quarter or year. Finally, Girish adds a third dimension to the story (showing project, time and team member) to show off some fascinating 3D data visualization. Since we were offline when he submitted the time sheet, we hit the local web service endpoint which stored the data locally until we were back online and synchronize all the offline data back to the server. That part was automatic since CRM knows which entities are offline and how to sync them back up. CRM is built from the ground up using web services so it’s a pretty standard experience to build the WPF app using the well known Visual Studio for developers and Expression Studio for the user interface and interaction designers. WPF supports data binding so it’s simple to pull the data in from CRM and surface it in WPF using standard or even 3rd party controls. In the last episode we talked about Microsoft Office SharePoint Server; in this one we talk about Microsoft Office on the client side. CRM actually integrates really really well with Microsoft Office Outlook right out of the box. That’s a natural as it’s the place where many people work day-in day-out (and especially those sales and marketing folks). But what about those people that need that data in Word or Excel? In this episode we talk about how easy it is to customize the integration of Dynamics CRM with Microsoft Office on the client side. This category of applications, often referred to as Office Business Applications (OBA), help to unlock the value of line-of-business (LOB) systems, such as the ones built on the Dynamics CRM platform, and turn document-based processes into real applications. There’s lots more info about these types of apps over at OBA Central. In the demo Girish put together, we see how the app is surfaced with a custom ribbon. This in turn opens a Status Report template which has a custom task pane. That task pane pulls all the relevant information for my status report from the CRM server (in our case CRM Online). It authenticates and then grabs the project info. When I choose a Project it also pulls in the work items for that project. Just like with the SharePoint example, it’s trivial to open a CRM form right from within Word where I review more detailed info or even start an Office Communicator session with the owner of the work item. I can then insert the work items along with descriptions and hours worked directly into the status report. Since you’ll want to share that status report with your customer, Girish built in the ability to publish it to Office Live Small Business. Office Live is the ideal place for sharing documents with customers or partners who won’t have access to SharePoint sites behind your firewall (and it’s free!). The secret sauce that allows these kinds of apps to be developed so quickly is right in Visual Studio in the form of Visual Studio Tools for Office (VSTO). As you might expect, the same authentication code we used in the SharePoint example is used for authentication from with the OBA. Then it’s just a case of using the Dynamics CRM web services to pull info from CRM and post it into the Word doc. Nice! In this segment Girish and I talk about how Dynamics CRM integrates with SharePoint. We begin with a little guidance for where you might use one over the other and where they work well together. And they sure do go well together. “Separated at birth” is how I put it in the video. Girish’s demo shows a custom SharePoint page. Not many people know that SharePoint can be stylized using CSS to build sites that look nothing like plain vanilla SharePoint. This is a pretty good example of that. We use a SharePoint List Web Part to pull data from CRM to show a list of CRM users and the hours from their time sheets. This was pulled directly from CRM using web services. We also show how could use that data to display a dashboard style gauge using Dundas Gauge for SharePoint. You can pull CRM data directly into SharePoint to build a dashboard. You can then pull that dashboard into the CRM web client (minus the SharePoint chrome). By pulling it into the web client it automatically shows up in the Outlook client. Speaking of Outlook; in the last segment we talked about customization but didn’t show the Outlook client so Girish gives us a quick tour of how that works also. Each of the forms in CRM are URL-addressable. Girish puts that to good use in showing how you can pop a CRM form directly from within SharePoint. He also shows how CRM lights up automatically when you have Office Communicator installed leaving room for some interesting Unified Communication scenarios. We should probably do an episode on UC soon. The segment wouldn’t be complete if we didn’t show some code. Girish built the list part using the Visual Studio Web Part project template. The code to pull in the time sheets into a list web part is about 10 lines of C#. The hardest part was doing the authentication. CRM provides a plug-able authentication mechanism and 3 different auth options out of the box. On-premise deployments will likely use Active Directory, while CRM Online uses Windows Live ID and finally if you’re deploying in a partner-hosted mode you’ll use form-based authentication. Girish shows how as an ISV you can build your application once and take all of those options into account. After that the code you write is portable across all the deployment options. Girish on my team has been working on a demo that demonstrates the capabilities of the Dynamics CRM platform. We figured it would be a lot more interesting to get some of that on video in the form of a conversation (as opposed to a screencast) so I get to play the role of interviewer and Girish is the “talent” :). In this episode, we started off thinking we’d talk about Dynamics CRM and SharePoint integration but got so deep into the underlying capabilities of CRM that we ran out of time. We’ll show you the SharePoint stuff in the next episode. I promise! The demo that Girish has been working on uses the scenario of a fictitious graphics design firm (i.e. a professional services organization). Clearly CRM works great for automating sales, service and marketing functions. What we think about is the stuff under the covers that can be used by developers and ISVs to build new applications that may or may not be related to CRM. That’s what we mean by the CRM platform. This includes the basic metadata required to store the data related to a line-of-business application. CRM uses the concept of entities and attributes to store data whether your online or offline (all stored in SQL Server). It also makes the building of relationships among those pretty simple. Once you’ve got your metadata defined then building forms for the UI (ASP.NET) and workflow (Workflow Foundation) for process are next. We’ll get into a lot more of the platform (and in particular the extensibility options) in the next few episodes. This document outlines the future direction of Microsoft Dynamics CRM through to the next major release, Microsoft Dynamics CRM “V.Next”, which will be aligned with the Office 14 wave of product releases due in late 2009/early 2010. Partners can grab a copy of this on PartnerSource. Customers can grab it on CustomerSource.